The Millennium Tree Line (MTL) was the idea of Dr Patrick Roper. In 1995 the University of Greenwich took up the project to ‘augment its interest in Greenwich and the Meridian’. The project was flawed and doomed to fail, which it did, but not before the expenditure of a large amount of public money. Patrick Roper (centre) and the University’s Vice-Chancellor, Dr David Fussey (right) ‘on the Line’ at the Royal Observatory, Greenwich. Millennium Tree Line Limited was incorporated on 22 April 1995. It was originally a subsidiary of the University of Greenwich, whose Finance and Estates Committee set a maximum investment in MTL of £100,000 over two years. Roper, one of nine directors, was also the Chief Executive. Fellow directors (all unpaid) included the Deputy Vice-Chancellor of the University, the Principal of Hadlow College of Agriculture and Horticulture, the National Projects Officer of the Tree Council and the Group Head of Corporate affairs of the Woolwich Building Society. Catherine Freeman was recruited as Project Manager. To create a lasting database of both the newly planted trees and of those already on the Line. Two key issues caused the project to fail. The first revolved around how to identify where on the ground the Meridian actually runs, and how this information could be made available to others. The second related to the practicalities of modern farming. When the project started, there were no detailed maps showing the course of the Meridian through England. Discussions with the Ordnance Survey indicated that the cost of supplying appropriate maps would run into tens of thousands of pounds, a fee that may have been waived if suitable ‘corporate advantage’ could be gained from the project. Although a special millennium edition of the Explorer Maps (1:25,000) showing the path of the Meridian was subsequently published, that would not have sufficed, because, quoting from the maps themselves, ‘the generalisation of the map detail at this scale means that the position of features may not be precise relative to the meridian line’. Thanks to evolving developments in GPS technologies, the provision of appropriate maps turned out to be largely academic. Although back in 1995, GPS signals were deliberately degraded for civil use so that its accuracy was no greater than about 100 metres, ways were being developed to overcome this through the use of differential GPS (DGPS). Planting, such as it was, began in November 1996, using a Trimble Pathfinder Pro XR with a claimed accuracy of better than 1 metre. Had the project stuck with the idea of using maps, the process by which the position of the Line would have been transferred from map to potential tree planting site would have involved a great deal of on-site measurement, something that would have been time-consuming and costly to carry out. Not only that, the maps would have been licensed only for use by MTL. DGPS has not dissimilar drawbacks. Its specialist nature means in practice, that anyone wanting to plant a tree within a metre of the Meridian Line is unlikely to be able to do so without the help of a professional. Before any trees could be planted, the project team had first to establish who owned the land over which the Meridian passes and whether the owners had any interest in participating in the project. This was a time-consuming and ultimately disappointing process, for even when an owner thought the project was a good idea; there were good practical reasons why many of them did not want plantings in their fields: trees are inconvenient to work around and liable to damage expensive farm machinery that passes too close. They also need protection until well established on grazing land. With planting across fields largely ruled out, so too was the prospect of growing a tree line that would ultimately be visible from the air. The alternatives were to plant on roadside verges, in or next to existing hedgerows, in woodland clearings, on a bank or beside a ditch, not necessarily the easiest of places for a tree to become established. Although MTL advocated planting beside ditches, in the fens, local bylaws might have prohibited this. Newly planted trees need nurturing in their early years. The evidence seems to suggest that aftercare such as watering, and tree tie loosening, was often lacking. Two years into the project, with the budget nearly spent, no significant additional funding having been raised, and also probably an awareness of the small number of trees that had been planted, the MTL directors were ‘…of the opinion that the company had done sufficient to raise the profile of the project’ and that others could now carry it forward and agreed that ‘… the company should cease trading from 1 August 1997.’ The project however appears to have continued to enjoy a degree of ongoing support from the University up to the time of the millennium, when the company was disposed of. The database (assuming it was ever created), no longer exits. The computer disks transferred with the company which may have contained it were unreadable and discarded. What does survive, are copies of the two MTL newsletters (February and Autumn 1996), a booklet, Helping the Tree Line Grow, (University of Greenwich, 1998), a few paper based notes, a small album of largely un-annotated photographs and some of the trees themselves. According to the newsletters, the first MTL planting took place on the South Coast on 20 October 1995 at Peacehaven County Infants School when three trees were planted. Assuming they hadn’t already died, these trees were lost when the school was rebuilt in 2000–01. The newsletters also inform us that the second planting took place at Bluntisham in Hertfordshire in May 1996. This tree died – probably due to lack of watering, given the less than ideal time of planting. It has since been replaced. 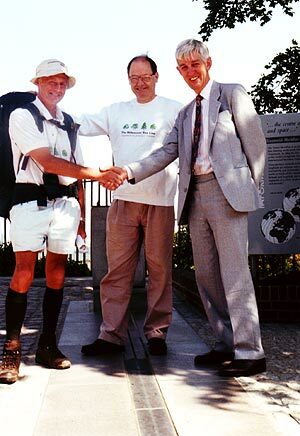 On 21 August 1996, a London paper, the News Shopper announced that plans were afoot by Bromley Council to mark the path of the Meridian through the borough with special plaques and a line of native trees, which were to be planted in co-operation of the Millennium Tree Line Project. In the event, the only trees that appear to have been planted were a small number of ornamental trees in the front and back gardens of private houses. Around the time of the millennium, those householders who had properties through which the Meridian passed were invited to apply to the Council for a free tree. Those who applied were provided with both a tree and a map (1:1250) showing the path of the Meridian. Regrettably, there was no requirement for householders to plant their tree on the Line. In some instances this would in any case have been impossible as the Line passed though the house rather than the garden. In others, there was sometimes no convenient point on the Line at which to plant it. Some chose to plant the tree in the rear garden although the Line actually crossed the front garden. Others did the opposite. Although some trees were planted on the Line, others are off by as much as 20 metres or more. No commemorative plaques were provided, so most of the trees are unmarked and indistinguishable from the other garden trees around them. What was probably the third MTL planting took place next to a football pitch at Addington High School, Croydon in November 1996. These trees either died, or perhaps more likely were deliberately removed for health and safety reasons. to celebrate the world entering the Third Millennium’. Of the thirty trees allegedly planted, not a single one has been located. In February 1997, the first of several plantings organised by MTL took place in Surrey. These were possibly the last before the company ceased trading that August. 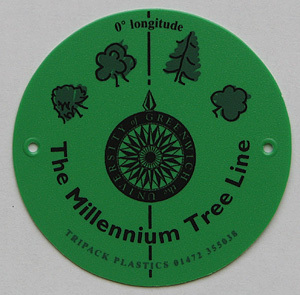 It was at this time that the distinctive green plastic marker discs donated by Tri-Pack of Grimsby were first used to mark the plantings. Some discs however, such as the ones in Snipe Dales Country Park, were not attached to trees, but to posts marking the path of the Line though existing plantings. Few of the discs are likely to survive in the medium to long term. A few later plantings took place in Cambridgeshire – though not all were directly on the line (even though some were marked with the green discs). Trees are also known to have been planted in Hertfordshire in the run up to the millennium. They are unmarked, and may or may not have been directly linked to the Millennium Tree Line project. In 1999, a number of Silver Limes were planted to both mark the Meridian and to celebrate the twenty-fifth anniversary of the Tree Council. Two were planted on the Line at East Court in East Grinstead in Sussex and two about 150 metres west of the Line adjacent to the north bank of the nearby Weir Wood Reservoir. The presence of the later two is recorded on an information board at an adjacent picnic site. Two trees (Silver Limes?) are also known to have been planted on the Line in Lincolnshire as part of the Tree Council celebrations. In around 2000, an unmarked row of trees was planted next to one of England’s oldest Meridian markings at Cleethorpes in Lincolnshire. The inspiration behind their marking is unknown. Mahogany trees (but not their locations) are also recorded as having been planted in Ghana (almost certainly near Accra) on 21 July 2000. What is believed to be the final planting organised directly by the Tree Line Project took place in November 1999. Appropriately perhaps, it was performed by David Fussey, the University of Greenwich’s Vice-Chancellor.